Workplace Safety Blog | Safetycare | Safety Training Videos | Free Safety Pictures and Resources: A 120,000 foot skydive? 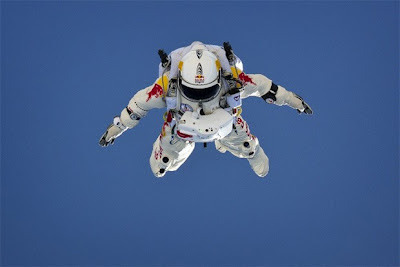 Felix Baumgartner is set to leap, in the most literal sense of the word, from relative obscurity into the history books. How? By jumping to earth from the edge of space, likely breaking the sound barrier as he does so. How does one go from humble Austrian beginnings to a capsule 120,000 feet (about 23 miles) above the Earth's surface? As you can imagine, leaping out of a capsule 23 miles above Roswell, N.M., isn't a project you cook up in a week or two. It was 2005 when Baumgartner started planning the idea with Red Bull. The core goal of the mission, dubbed "Stratos," is to break a 52-year-old record set by former US Air Force command pilot Joe Kittinger. That record? A 19-mile skydive.